Share the post "Snake Gourd: Interesting Facts, Uses And Growing Tips"
Trichosanthes cucumerina is a tropical or subtropical vine. The common name “Snake Gourd” refers to the narrow, twisted, elongated fruit. Common name: Snake Gourd, Serpent Gourd, Chichinda, Padwal, Snake Tomato (En). Patole, Concombre-Serpent, Serpent Végétal (Fr). Abóbora Serpente, Quiabo de Metro (Po). 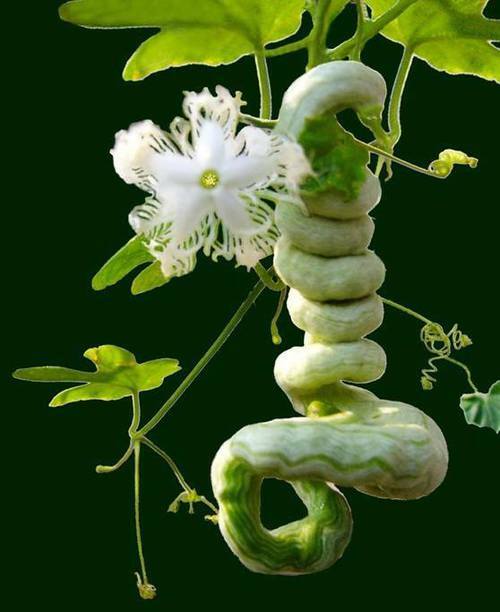 The Snake Gourd (Trichosanthes cucumerina var. Anguina), was probably originally domesticated in ancient times in India, and the wild form of the species (Trichosanthes cucumerina var. cucumerina) is native to southern and eastern Asia, including India, Bangladesh, Nepal, Pakistan, Sri Lanka, Indonesia, Malaysia, Myanmar (Burma), and southern China (Guangxi and Yunnan), as well as Australia and islands of the western Pacific. It is locally grown as a vegetable in home gardens in Africa. – It is a member of the pumpkin family (Cucurbitaceae). – The soft-skinned immature fruit has soft, bland, somewhat mucilaginous flesh which is similar to that of the luffa and the calabash. – Fully mature snake gourds are tough enough to be turned into didgeridoos – traditional Australian musical instruments. – A beautiful white and strongly scented flower, fringed with long, lace-like tendrils opens in the evening or in the early morning, so the plant can be pollinated by moths. – Someone in Oman claimed to have grown the longest ever snake gourd – 1.88 m! – The shoots, tendrils, and leaves of the plant are also eaten as greens. – With some cultivars, the immature fruit has an unpleasant odor and a slightly bitter taste, both of which disappear in cooking. – Young fruit can be used in curries or eaten as a vegetable like green beans. – The fruit becomes too bitter to eat as it reaches maturity. – Fruits can be up to 200 cm long, deep red at maturity. – The fruit contains a reddish pulp that is used in Africa as a substitute for tomatoes. – The plants are also grown in compounds as a dual purpose vegetable and ornamental for the white, fringed flowers, fragrant at night, and the decorative fruits. – These days a smaller variety of snakegourd is cultivated and widely available in India and in Indian grocery stores in the US. Snake gourd is packed with myriad nutritional benefits. The gourd comprises of protein, fat, carbohydrate and soluble fiber. Its mineral and vitamin content are calcium, phosphorus, riboflavin, thiamin, niacin and carotene. It is quite a popular vegetable in Indian cooking. It’s rather bland taste makes it ideal for use with different spices. 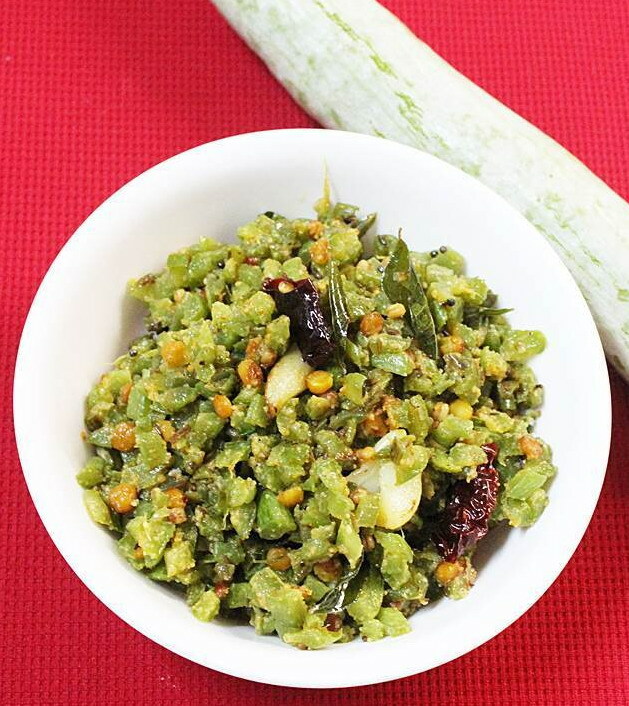 In North India, snake gourd is usually cooked in dals (lentil soups), while in South India, snake gourd is used in dry and gravy curries, soups, and raitas. Snake gourd curry or stir fry is a very easy and healthy dish that can be prepared in just 15 mins if you have all ingredients chopped in hand. – Scrape off the whitish layer on the snake gourd with a knife. Rub some salt on the snake gourd and wash it off. – Cut off the ends. Cut to 2 to 3 parts. – Cut length wise each part, remove the seeds and the white layers inside. Chop to cubes. – Heat a pan with oil, add mustard, cumin, dals when they turn golden, add red chili, curry leaves and garlic. Fry till they turn crisp, add the hing. – Add cubes of snake gourd and fry on high for 2 to 3 mins, reduce the flame and fry till cooked well. Keep stirring to prevent snake gourd curry from burning. Sprinkle the vepudu karam. Mix well. Serve with rice and rasam. – The mature fruit has been reported as purgative. An infusion of the young shoot is mildly aperient, the leaf sap is emetic and the seeds are anthelmintic and antiperiodic. – According to Ayurveda, the plant pacifies vitiated pitta, constipation, skin diseases, burning sensation, diabetes, anorexia, flatulence, constipation, worm infestation, fever and general weakness. – Trichosanthes cucumerina is one of the medicinal plants that is often used in Sri Lankan traditional systems of medicine. One of its uses is the treatment of inflammatory conditions. 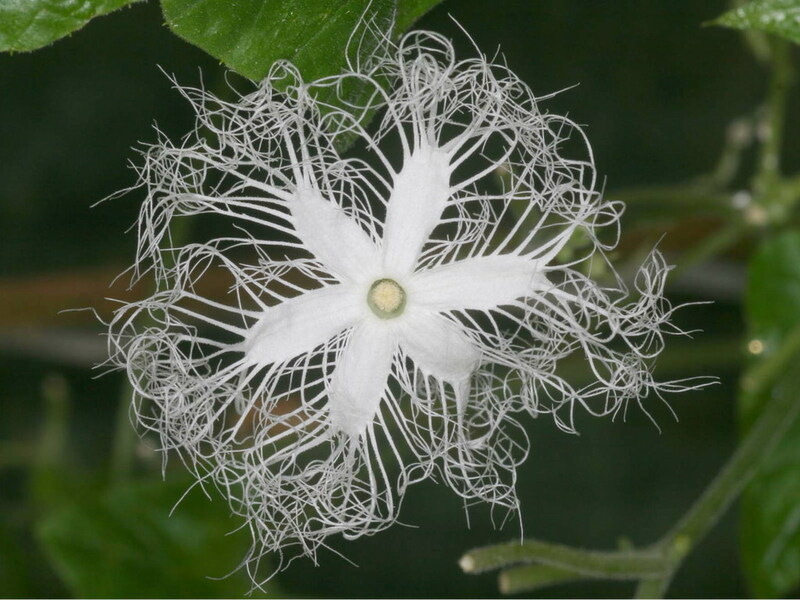 The snake gourd plant (trichosanthes anguina) is a tropical creeper and is usually grown over wooden lattice frames, and the gourds dangle down from a canopy of leaves. 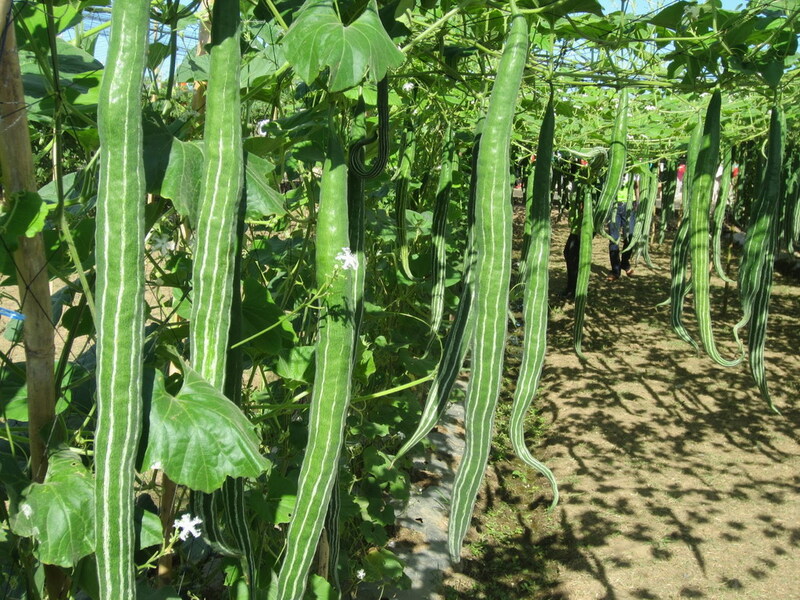 The optimum average day temperature for growth the snake gourd is 30–35°C with a minimum of 20°C. The plant does not tolerate dry soil and requires a good moisture reserve in the soil, but sensitive to waterlogging. It cannot grow in the shade. It is in flower from July to September, and the seeds ripen from September to October. Farmers prefer direct sowing because of the delicate character of the plant, in planting holes or on ridges 100–150 cm apart and 60–75 cm between plants. Fruits are usually picked when still immature about 2 weeks after fruit set, when they are 30–60 cm in length, or up to 1 m depending on the cultivar, and may weigh up to 1 kg. Fruits are picked at full maturity for the fruit pulp. Do you grow Snake gourds (Trichosanthes cucumerina) in your garden? What is your experience with this plant? Please share in the comments below! Do you sell Snake gourds (Trichosanthes cucumerina) seeds or have plants for sale? You can place your advertisement here. Contact us now!